Up is a beautiful movie. It is funny, occasionally thrilling, visually stunning, fast-paced, and fun. And if you don't get a little teary-eyed during a couple of parts of the movie then you have no human heart. The movie is about Carl, an old man whose wife has recently died before the two of them could complete their life's goal, going to find a specific, hidden waterfall somewhere in South America. Carl basically shuts completely down. He doesn't care about anything except keeping his house exactly in the same way it's always been, like a mausoleum to his dead wife. He just wants to be left alone, basically to die. 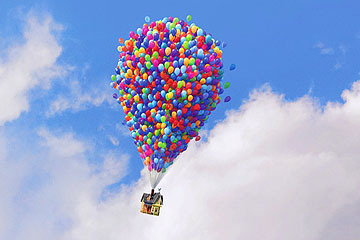 When outside forces and a series of events happen that threaten his ability to keep the house, he conceives what is basically a fantastic suicide: he will fly the house to South America with thousands of helium balloons, fulfilling his and his wife's life goal. It's never explicitly said that this is a suicide mission, but what else could it be? How long can Carl survive on a high plateau in the middle of nowhere? How much food did he bring? Fortunately his plan is messed up by the accidental stowaway of a young "Wilderness Explorer" named Russell, who fell asleep on his porch before the house took off. The movie is not the movie you think it is going to be. You think it's going to be a buddy comedy about Carl & Russell flying through the air in the house. Yes, Carl takes off in his house with stowaway Russell, but the sequence of the house in the air is actually very short. There's only one complication (a storm) and then they arrive in South America, and for the vast majority of the story the house is barely buoyant, being tethered to Carl as he walks around Venezuela. It is, I think, a great decision because it allows so much more varied settings and character interactions. There are steppes, jungles, rocky chasms, caves, etc. The animation is also 100% top-notch, which is almost to be expected from Pixar nowadays to the point where you almost forget that what is going on is some of the best CG animation you've ever seen. Especially striking are Dug the dog, who moves so much like a real dog that it is squeal-with-glee good, and Kevin the bird, who is basically a gigantic Muppet. Live-action filmmakers would be lucky to get performances as good as Carl and Russell. Thanks muchly to an unbelievably good opening sequence, we know a great deal about the inner workings of Carl already, and so Docter & crew didn't have to labor to put over his emotions. Small things in Carl's face and posture and hands have big impact. There is a lot of good humor, much of it the hard-earned kind where it comes out of intelligently-realized character interactions instead of wacky non-sequitur gags and funny one-liners (*cough* Dreamworks *cough*). There were three times, though, where something surprising happened that made me just about fall out of my chair. I'm sure the whole theater could hear me. The movie is also extraordinarily well-paced. It moves forward at a good clip and covers a lot of ground, but it knows when to stop and breathe and really explore the potentialities of a moment. It has a very real sense of discovery to it (like during the initial interactions between Russell and Kevin), which is a quality sorely lacking in Dreamworks' recent Kung-Fu Panda. At the same time it doesn't feel like an exhausting epic or a grueling ordeal like Miyazaki's Spirited Away. It leaves you feeling satisfied and uplifted. The movie is essentially about the value of promises. When you make two promises that end up being contradictory, can you keep them both? Which one is more valuable -- one you made years ago with a great deal of seriousness to someone who is now dead, or one made off-handedly on the spur of the moment to someone who is right there in front of you? The ultimate lesson seems to be that keeping your eye on a distant goal can keep you from seeing what's valuable right around you. Also: Don't commit suicide, 'cause you can always find more reasons to live even when you think you're done.